Your PIN number, or parcel identification number, identifies your particular piece of property. If you need this number, contact the Chief County Assessment Office at 815-895-7120. You can give them your name and the property address, and they can provide you with a PIN number. I haven’t received my tax bill yet. When will I get it? Tax bills were mailed on May 1, 2018. If you do not receive your bill by May 16, 2018, please contact our office at 815-895-7112. If you do not receive a bill, it is your responsibility to contact our office to get a duplicate bill. If you are a new homeowner and the bill was issued in the previous owner’s name, contact the Treasurer’s Office for a duplicate bill. Failure to receive a tax bill, or receiving one late for any reason, will not relieve the taxpayer from paying taxes or late penalties. What if I just purchased the property and didn’t own it last year? New homeowners should check their real estate closing documents, or with their title company or attorney, to see if they owe for taxes due this year. Depending upon the closing and document recording dates, the tax bill may have been sent to the previous owner. If you find that you do owe taxes, please contact the Treasurer’s office for a duplicate bill. By acting quickly you may avoid delinquent taxes and penalties. What if I receive a bill that is not my responsibility to pay? If a mortgage company is to pay your bill, it is your responsibility to call them and ask if you need to send them a copy. Many mortgage companies now pay electronically and may not require a bill. If you no longer own the property, it is your responsibility to forward the bill to the new owner. When is each installment due? The first installment is due on June 4, 2018. The second installment is due on September 4, 2018. Can I pay both installments at once? Yes, as long as it is done on or before the first installment due date. What are the different ways that I can pay my bill? You may pay your bill on-line with Discover Card, MasterCard, Visa or American Express credit cards, or with Visa or MasterCard Debit cards. A convenience fee, charged by the card processor, will apply. For all credit card and MasterCard Debit card payments, the convenience fee is 2.35% of the amount charged. The Visa Debit card charge is a flat convenience fee of $3.95. You may also pay with an E-Check for a $1.00 convenience fee.To pay online, log on to www.dekalbcounty.org and click on the red link that says “Pay My Property Tax”. Enter your parcel number or name, follow the prompts, and check out using the Shopping Cart link located near the upper right of the screen. The convenience fee applied for using this option is neither charged nor collected by the DeKalb County Treasurer’s Office. You may pay your bill at most banks throughout DeKalb County, on or before the due date. Banks cannot accept any payments after the due date. Take your entire bill to the bank. Please be sure to write your parcel number on your check to insure proper credit. Your cancelled check will be your receipt. You may pay your bill by mail. Include the proper installment stub(s) and write your parcel number on your check to insure proper credit. Your cancelled check will be your receipt. Your payment must be postmarked on or before the due date. It is strongly recommended that you take your payment inside the post office and have them hand cancel it at their counter. We accept personal or business checks until September 28, 2018. After that date, you must pay with cash, certified check or money order. You may pay with your Discover Card, MasterCard, Visa or American Express up until Friday, October 19, 2018. You may pay your bill at the DeKalb County Treasurer’s Office. Our hours are 8:30 a.m. – 4:30 p.m., Monday through Friday, except for holidays. We are located on the fourth floor of the DeKalb County Administration Building, 110 E. Sycamore Street in Sycamore, Illinois. You may pay with a credit card, debit card, personal or business check, cashier’s check, money order, or cash. Personal and business checks will be accepted until September 28, 2018. Credit and debit cards will be accepted until the close of business on Friday, October 19, 2018. A convenience fee of 2.35% will apply to all credit card and MasterCard debit card payments. For Visa Debit card payments, a $3.95 convenience fee will apply. Those taxpayers who intend to pay at the office should be aware that parking is extremely limited due to the jail expansion project. Taxpayers are encouraged to mail their payments so that they are postmarked on or before the due date, or to make their payment at a local bank on or before the due date, to avoid the congestion. Yes, we do. Be sure to mail your payment on or before the due date, and that the Post Office marks your envelope with the date that you mail your payment. It is strongly recommended that you take your payment inside the Post Office and have it hand cancelled at the counter. When the first installment due date has passed, how much do I pay? The total due for the first installment after the due date should include a penalty amount of 1.5% per month. The penalty amounts and dates the amounts are valid are listed on the payment stub. Once the due date has passed, banks can no longer accept first installment payments. When does the penalty increase again? The penalty amount increases every 30 days. What happens if I do not pay my taxes by the second installment due date? After the second installment payments are posted, delinquent bills will be sent by certified mail. At that time, there is a $10.00 per parcel charge for sending the delinquent bill as certified mail and for the publication of names of delinquent taxpayers in the newspapers. This is in addition to the penalties assessed after the due date(s). Will you still accept personal checks and online payments once taxes become delinquent? We will accept personal or business checks until Friday, September 28, 2018. After that date, you must pay with cash, cashier’s check or money order in our office. On-line payments are accepted until October 19, 2018. What if I cannot pay my taxes? What will happen to my property? If you are late, you may still pay your taxes and penalties up until 4:30 p.m. on Friday, October 26, 2018. We are required by law to hold a tax sale, which will be held on Monday, October 29, 2018. At that time, your taxes will be sold to someone who will pay them for you. It is important to note, the property itself is not sold. After the tax sale, you will be liable for the tax amount sold at the tax sale and interest at a rate determined the day of the sale. What do I do if I believe my tax bill is incorrect? Your tax bill is determined by two factors: the equalized assessed value of your property, and the tax rate.Questions regarding equalized assessed values or exemptions should be directed to the Chief County Assessments Office at 815-895-7120.Tax rates are computed by the County Clerk based on the amount levied by each local governmental taxing body. Questions regarding tax rates and tax levies should be directed to the County Clerk’s Office at 815/895-7152. 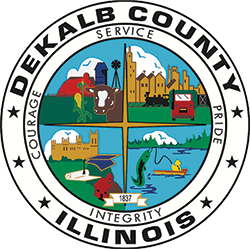 To protest a tax rate, please contact the DeKalb County Treasurer’s office for detailed instructions for filing an appeal. To effectively appeal a tax rate, you must prove that the rate or a portion of the rate is illegal or excessive. Please contact the treasurer@dekalbcounty.org for detailed instructions for filing an appeal of your tax rate.